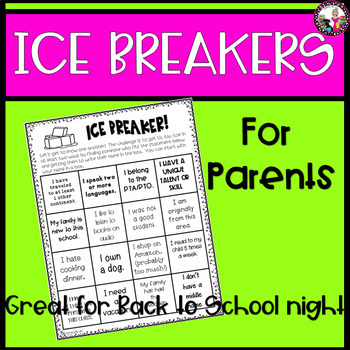 Ice Breakers for Parents & Kids! A Get-To-Know-You Activity! Don’t you just LOVE a good ice breaker? The tension at Back to School night usually runs high as parents don’t know what to expect! This tic-tac-toe ice breaker is sure to get your parents talking and laughing before your presentation! Also included is an ice breaker for kids to use as a way for them to get to know each other during those first few days of school! ***Remember when you purchase products on TpT and then RATE them, you are getting TpT credits that turn into dollars!!! Just go to your “My Purchases” page and click on “provide feedback”! It’s that easy!